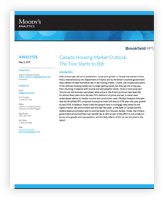 RPS, a leading provider of Canadian residential real estate valuation and business intelligence, and Moody’s Analytics, a leader in regional economic forecasting, have partnered to create the most authoritative Canadian house price forecasts available. 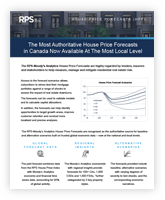 The RPS – Moody’s Analytics House Price Forecasts simulate the path of Canadian house prices under a range of economic conditions and scenarios, enabling clients to more accurately stress-test the impact of shocks and differing assumptions on their portfolios and better assess the risks and opportunities facing their business and investments. The forecasts are updated quarterly reflecting the latest data, conditions, and expectations. They are backed by the analytical expertise of more than 80 economists, and data is updated in real time as new economic figures are published.